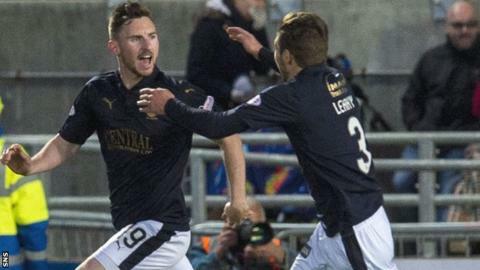 Falkirk match-winner Bob McHugh says it would be "unbelievable" for the Bairns to end a six-year absence from the top flight and return to the Premiership. McHugh's dramatic strike in the 92nd minute saw Falkirk beat Hibernian 5-4 on aggregate to set up a Premiership play-off final against Kilmarnock. "It would be a dream come true getting back to the Premiership," said McHugh. "Going up the way we would do if we beat Kilmarnock would be unbelievable for the club and the fans." Just one defeat in their last 13 Championship matches helped Falkirk clinch second place on goal difference ahead of Hibs to avoid a two-legged play-off quarter-final, where Hibs beat Raith Rovers. The Bairns' subsequent victory over Alan Stubbs' side - 3-2 on Friday after a 2-2 draw in the first leg at Easter Road - brings a showdown with Lee Clark's Kilmarnock, who will finish 11th in the Premiership. The first leg will take place at the Falkirk Stadium on Thursday, with the return at Rugby Park next Sunday, 22 May. McHugh, 24, admitted he had a relatively sleepless night after his late heroics on Friday. "I was lying in bed still wide awake at four o'clock in the morning," he told BBC Radio Scotland. "I'm not sure what time I got to sleep but I only had a couple of hours." The former Motherwell forward, who had loan spells at Queen of the South and Airdrie in the past two seasons before joining Falkirk last summer, believes the Bairns - who were relegated from the Premiership in 2010 - are well placed to maintain their form in the final. "I think it is quite an even balance because Kilmarnock and Hibs are probably at a similar level," he said. "But we are going into the game with a bit of momentum so let's hope that can get us over the line. We will prepare right this week and hopefully get it done." McHugh has scored 10 goals this season and six of them have been in the final 10 minutes of matches, with four coming in the 90th minute or beyond. Three of his strikes have come against Hibs, including a last-minute equaliser in their league game at Easter Road last month, and an 80th-minute leveller in the first leg of their semi-final. "I mentioned to the coaches a couple of weeks back that most of the goals in my career have been in the second half, and most of them have been late on," he added. "It is something I have a good habit of doing in my career and it gives you that belief late into the game that you can pop up and get a goal."